This post is part three of a series in which I’ll summarize what I know about publishing calendars openly on the web, for free, using popular calendar applications including Outlook, Google Calendar, and Apple iCal. protocol, and the same kind of server, as the .Mac service uses. special-purpose web server commonly used for calendar publishing. use, for no additional charge. But for many people it would be ideal if there were a free service available for this purpose. One such service is iCal Exchange. 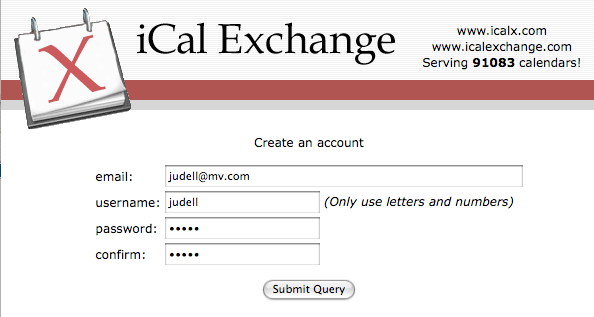 For private sharing you can create passwords and use the private URL, but our goal here is public sharing so the public URL — in this case, http://icalx.com/public/judell — is the one you’ll use. Now switch to iCal, select Calendar, select Publish, and switch the Publish option from the default — .Mac — to Private Server. Paste the public URL you just created into the Base URL, and enter your iCal Exchange credentials in the Login and Password fields. 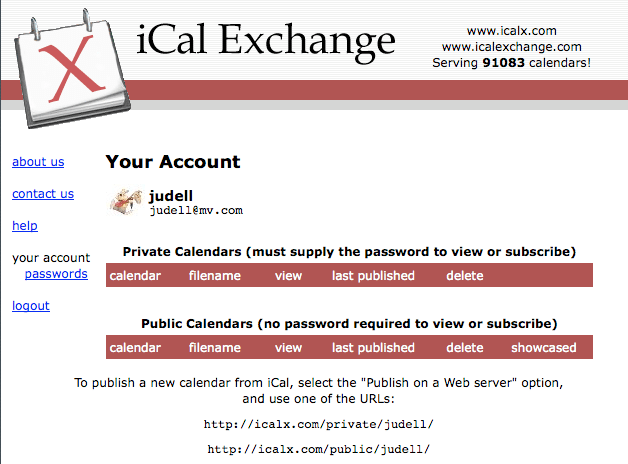 The web address for your calendar is the public web address that iCal Exchange gave you, plus the name you gave your calendar (in this case, Jon), plus the .ics extension. For this example, it adds up to webcal://icalx.com/public/judell/Jon.ics. This solves half of the problem. Your calendar is now published in a way that enables individuals to subscribe to it. It’s also available for syndication by online services like http://elmcity.info/events. But the other half of the problem remains unsolved. In parts one and two of this series, we saw that the free calendar hosting options offered by Microsoft and Google provide links to hosted calendar viewers. There are a variety of other hosted viewers, but as yet I’ve not found one that’s free, and can render any public calendar given a public URL like the one shown here. If such a service does exist, I’m hoping this entry will help me find it. Author Jon UdellPosted on 28 May 2008 28 May 2008 Categories . Bedework has a free-busy aggregator proof-of-concept that could probably be extended to view an arbitrary .ics file, given you can currently upload one into a private calendar. The two problems are someone actually hooking up these two things, and the fact Bedework is just an app and needs hosting, not a service per se. Yeah, that’s the rub. It’d be sweet if a service like iCal Exchange ran a hosted viewer, based on something like PHP iCalendar, that could be configured to point at arbitrary remote ICS files. iCalPublish already does Free/Busy and publishes to iCalx and other WebDAV sites. I’m just a user of iCalPublish. I also use iCalPublish, iCalx and Google Calendar to sync my 48 calendars! In addition, because we use Famundo for Families at home, we can subscribe to the school’s Famundo calendar to automatically view the school events on our family calendar. It works great for the school, for families that don’t use Famundo, and especially for those of us who do! >> There are a variety of other hosted viewers, but as yet I’ve not found one that’s free, and can render any public calendar given a public URL like the one shown here. If such a service does exist, I’m hoping this entry will help me find it. Although primarily intended as a commercial calendar publishing service, InstantCal (instantcal.com) provides a hosted viewer which will render a public calendar given a public URL. And it is free for low volume use. InstantCal is currently in Beta, and comments and feedback about the service are always welcome. http://www.ical-mac.com is another very nice free calendar publishing service. I’ve used it for a while now, and I’m quite happy with it. Especially the feature where you can create users that can view your calendar and block all others. I like my calendars online, but I also like my privacy.